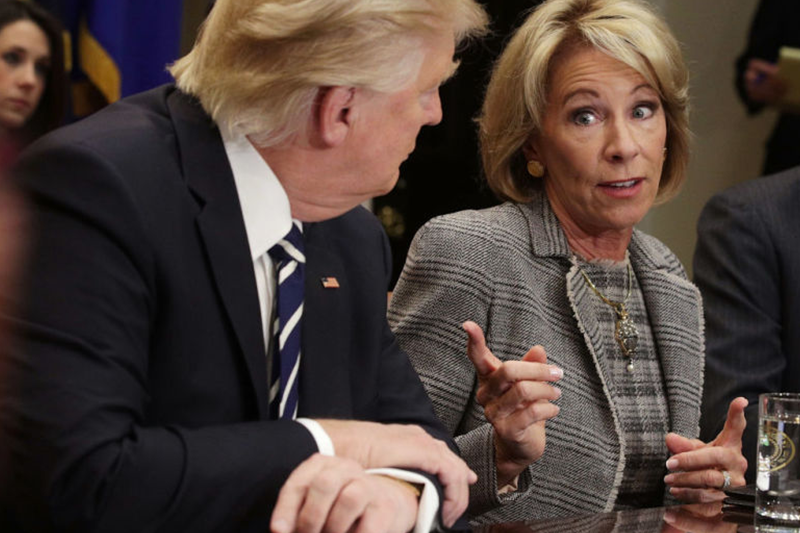 Because Betsy DeVos is a mediocre white woman who spends her time spending her wealthy husband’s money—in fact, the DeVos family has donated millions to the Republican Party—she was gifted the job of education secretary. In this position, she has excelled in moving the nation toward for-profit schooling. Which is why it makes perfect sense that DeVos’ pick to lead the nation’s $1.3 trillion student loan system is the CEO of a private student loan company. That’s right, the new chief operating officer of Federal Student Aid is A. Wayne Johnson, “the founder and chief executive of Reunion Financial Services, a company that originates and refinances student loans,” The Hill reports. For those in the back, it’s like a payday lender running Bank of America. But what makes the news even more interesting is that the Education Department’s release noting Johnson’s new job seemed to omit the fact that he ran a for-profit student loan business. The Hill reports that Johnson will replace James Runcie, who resigned when he realized this administration was a shell corporation to funnel in Russian money after a dispute with DeVos.